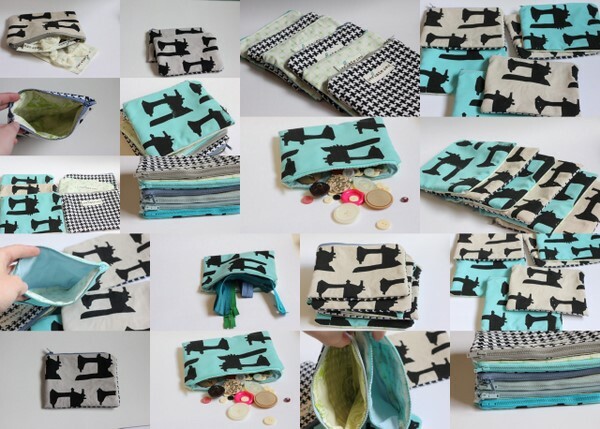 let’s make some zipper pouches! This is a lined basic zipper pouch tutorial that is great for beginners! They are great for everything! To begin you need four pieces each measuring 6.5″ tall by 8″ wide. A front, back and two lining pieces. If you’re going to add a label, do that first. And you need a zipper, about 8″ long. Stitch at 1/4″ with a straight stitch. This is what you’ll have. Topstitch close to the edge. Pin back and front right sides together and lining pieces right sides together. The end of the zipper should be pinned to the lining pieces. Sew it up with a 1/2″ seam allowance, leaving a few inches open at the bottom of the lining. Sew it up with a straight stitch, backstitching at each end. Push the lining to the inside and you’re all done! If you liked this post but want a non-zipper pouch, try this cute and easy velcro wallet tutorial! MAKE [BELIEVE] by Pattern Anthology guest post: Yellow Plum Blossoms $100 Harts Fabric giveaway! Win some of the best apparel fabric! Aztec Hooded Vest Round Up! Zippers always scare me, but I think I can do this one! Thanks for the tutorial! These are fabulous! I’d love for you to link up at my new Tuesday Time Out! Oh man, I’m such a slacker. I don’t top-stitch. Looks really nice that way though! that sewing machine fabric is super cute! Great tutorial! I’ve been sewing for more years than I want to admit…and have been avoiding zippers like the plague. I think it is time to start using them again. Thanks for the confidence boost!! So cool! I love this tutorial. It looks so easy:) Thanks so much for sharing. I love the fabric you used!! Saw you on Sew Much Ado. I have been wanting to make one of these….Thank you for sharing :) LOVE IT! These are so fun! You picked some great fabric!! I have never sewn anything with a zipper before, but this looks pretty easy! Thanks for the tutorial! :) Would love for you to join my linky party! Love this. Zippers are my next step in the sewing ladder so this is definitely on my list. They are so cute and thanks for the great tutorial! Just wanted you to know your tutorial worked like a charm! I made the CUTEST little pouch today, in about an hour. LOVE IT!! This looks so easy to do! The only zipper pouch I’ve ever made turned out okay, but for some reason the zipper sticks and it’s really hard to work. I’m gonna try this one today and see if I get better results! Now that’s a tutorial I feel confident about trying. Thank you for taking such clear pics and writing such clear instructions. Thank you for this tutorial. I’ve just made a zipper pouch – in about half an hour thanks to your great explanations. Thanks for the tutorial! This was my first go at putting in zippers, and thanks to your detailed pictures it went rather well! I am not sure I sewed the zipper to the inside lining correctly, because it bunched up a bit, but I was happy with this first attempt. Love your blog! I did it! Thankfully this is a pretty forgiving pattern because I’m a new sewer. Thanks to your great instructions, I’m not the proud owner of a my very own zipper pouch! Thank you Kate! Just spent the quickest 30 mins of my day admiring your work! so very inspiring! thanks! Wow. This is such a good tutorial. Using the different fabrics and zipper made this easy to follow. I was able to make a halfway decent pouch on the first try and i had never even sewn a zipper before! Excellent tutorial! This is so cool! I’ve never even attempted a zipper but going to have to give it a shot! How fun! Thanks so much for posting this! I’ve looked at a lot of tutorials for zipper pouches and this one’s the best out there! Just made 3 tonight and off to the store for more zippers tomorrow. Love using up scrap fabric this way, thanks for posting it. Just posted my story about these with a link to your Blog, thanks again! Kate, I loved this tutorial. After watching and reading countless ones on zippered pouches I only dared to try them once I found your site. Thank you for making it simple and adorable to read. You rock! It looks like you used a regular foot instead of a zipper foot? I’ve only done zippers with a zipper foot and didn’t realize a regular foot would work.